Children will love discovering the post office, the recreation center, the candy house, the elves? 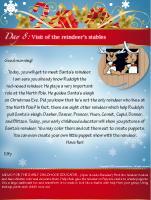 workshop, the reindeer?s stables, and so much more! (Open thematic poster-Christmas-The North Pole) Print, laminate, and decorate the walls of your daycare with all kinds of posters. The educatall.com team has prepared a series of special activities for the days leading up to Christmas. 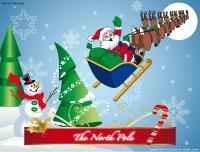 Children are invited to participate in a guided tour of the North Pole to discover all of Santa's little secrets. This tour ends with a special Christmas morning breakfast. Elfy, the elf in charge of the tour, will guide children throughout their trip. (Open Elfy the elf) Print. Use Elfy as a puppet whenever you are reading the letters to your group. Memo for the early childhood educator: Print the nine letters and prepare a scenario for your group. Make a special Christmas mailbox and use it to deliver the letters. 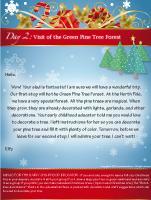 Each day, ask a different child to check the mailbox and give you Elfy's latest letter. However, before opening each of the letters, Elfy would like your group to sing a few Christmas songs. 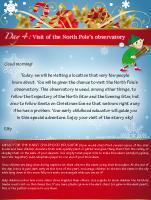 Read the letters for your group and complete the daily challenges or activities suggested by Elfy. Hang a garland within the daycare. You can use it to hang pictures of the different sites visited throughout your trip. 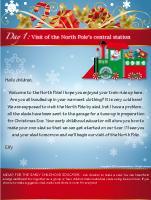 (Open passport-Guided tour of the North Pole) Print a copy for each child. At the end of each day, invite children to color the page which corresponds to their most recent visit. Welcome to the North Pole! I hope you enjoyed your train ride up here. Are you all bundled up in your warmest clothing? It is very cold at the North Pole! We are supposed to visit the North Pole by sled, but I have a problem... all the sleds have been sent to the garage for a tune-up in preparation for Christmas Eve. Your early childhood educator will show you how to make your own sled so that we can get started on our tour. I'll see you and your sled tomorrow and we'll begin our visit of the North Pole. Ask children to make a sled. You can transform a large cardboard box together as a group or have children make individual sleds using tissue boxes. If you choose to make a gigantic sled, make sure there is room for everyone! Wow! Your sled is fantastic! I am sure we will have a wonderful trip. Our first stop will be the Green Pine Tree Forest. At the North Pole, we have a very special forest. All the pine trees are magical. When they grow, they are already decorated with lights, garlands, and other decorations. Your early childhood educator told me you would love to decorate a tree. I left instructions for her so you can decorate your pine tree and fill it with plenty of color. Tomorrow, before we leave for our second stop, I will admire your tree. I can't wait! Memo for the early childhood educator: If you are lucky enough to have a full-size Christmas tree in your daycare, decorate it with your group. If not, draw a large pine tree on green cardboard and decorate it as a group. If you prefer, you can make individual Christmas trees. (Open model Christmas tree) The "Christmas decorations" theme in the educatall archives is packed with decoration and craft suggestions which can be used to decorate your tree. I hope you are enjoying your visit of the North Pole so far. There are still so many things to discover! Your Christmas tree is beautiful! I am tempted to take it to the Green Pine Tree Forest... it would fit right in! Today, we will be visiting a very important piece of the North Pole, the post office. This is where all the letters sent to Santa arrive. We receive thousands of letters each week. 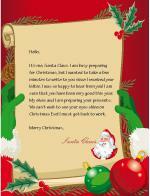 Have you ever written to Santa? He loves reading your letters as he sits by his fireplace. Your early childhood educator will give you special Christmas paper. Use it to write your letters to Santa. When you are done, just drop them in your Christmas mailbox. I will deliver them to Santa for you. P.S. Santa really loves colourful drawings! Today, we will be visiting a location that very few people know about. You will be given the chance to visit the North Pole's observatory. This observatory is used, among other things, to follow the trajectory of the North Star and the Evening Star, but also to follow Santa on Christmas Eve so that we know right away if he has a problem. Your early childhood educator will guide you in this special adventure. Enjoy your visit of the starry sky! Memo for the early childhood educator: (Open model-star) Print several copies of the star model and have children decorate them with sparkly paint or glitter and glue. Hang them from the ceiling or display them on the walls of your daycare. Use empty toilet paper rolls to make binoculars (simply by gluing two rolls together). Add cellophane paper to one end of your binoculars. Once children are lying down during naptime, let them observe the stars using their binoculars. At the end of the day (since it gets dark early at this time of the year), encourage children to observe the stars in the sky while lying down in the snow. Why not make snow angels while you are at it? Help children notice how some stars shine brighter than others. Use a globe to show children the territory Santa must visit on Christmas Eve. If you have plastic glow-in-the-dark stars (or glow-in-the-dark paint), this is the perfect occasion to use them. How are you this morning? Because you have worked very hard since you've arrived at the North Pole, I have decided to take you to the North Pole's recreation centre today. We will enjoy a day filled with fun and relaxation! The elves meet at the recreation centre on their day off to play and to meet their friends. As you will see, there are many fun games and activities to explore! Enjoy your day. Tomorrow, we will begin the second part of the tour and we will be very busy! Have fun! 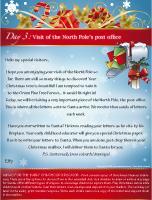 Memo for the early childhood educator: The educatall club includes several Christmas activity suggestions. You may also try the activities listed below. Be sure to choose the ones you feel are best suited to your group's interests and abilities. (Open Christmas tree decorations) Print, cut out, and laminate the Christmas tree decorations. Create an obstacle course and deposit decorations throughout. To the sound of music, children complete the course and collect one decoration. Once they reach the end of the obstacle course, they must hang their decoration in the Christmas tree (a real tree or a cardboard tree). (Open model-Gifts) Print and cut out enough gifts so that each child has at least ten. Deposit all the gifts in the centre of your parachute or a blanket. Children firmly hold the edges of the blanket. When you give the signal, everyone raises the parachute up over their head. When the gifts fall back down, children race to collect as many as possible. If you wish, count how many gifts each child collected. Variation for younger children: Simply stand on a chair and let gifts fall from above. Little ones will love trying to catch them. (Open game-Christmas Twister) Print and stick the larger illustrations on the floor (Mac-Tac) on a 4 square-foot surface. The leader of the game picks one Christmas card and one body part card. Like in the traditional Twister game, he gives the group instructions. For example, he may say, "Place one foot on the bell." Variation for younger children: Use the illustrations to decorate your daycare or for a simple recognition game. You can, for example, ask little ones to touch the bell. You may also choose to simply stick the illustrations on the floor for babies to admire. You will need ten 1-litre bottles. Add approximately one inch of water to the bottom of each bottle. Glue a Christmas illustration on each bottle. Line up your "bowling pins". With a small ball, children must try to knock down the bowling pin which has the Christmas item you call out on it. If you prefer, print a second copy of the illustrations you added to the bottles and have children pick a card to determine which bowling pin they must aim for. Variation for younger children: Let them simply roll the ball towards the bowling pins, knocking down as many as they can. You may also add food coloring to the bottles along with a variety of objects such as cotton balls, confetti, glitter, etc. Young children will enjoy shaking them. (Open game-Lotto Christmas) Print and laminate the playing cards and the smaller illustration cards. Give each child a playing card. Place the smaller cards face down on a table. Children take turns picking a smaller card. The child who has the corresponding item on his/her playing card may deposit it in the correct square. The first child to collect his/her four items wins. (Open Game bingo-Christmas) Play bingo with your group. Print, laminate, and store the game in a Christmas gift box. So, did your day off feel good yesterday? Did you enjoy yourselves? 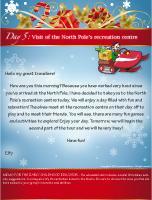 Today, we will visit the North Pole's Christmas candy house. In fact, we need your ideas. Santa wants to renovate the candy house, but he's not sure what to do with it. He would like us to prepare several different models to inspire him. Your early childhood educator has everything you need to make tiny candy house models. Hope you have very sweet fun! Memo for the early childhood educator: You will need Graham cookies, icing, and many different types of candy for this activity. Children build their own candy houses using the Graham cookies. They can use the icing to make the Graham cookies stick together. Once the structures are completed, they can decorate their candy houses by first covering them with icing and then adding candy pieces. Offer Smarties, chocolate chips, liquorice, jelly beans, etc. 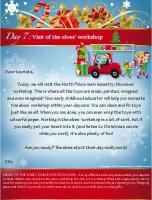 Today, we will visit the North Pole's main industry: the elves' workshop. This is where all the toys are made, painted, wrapped, and even imagined! Your early childhood educator will help you recreate the elves' workshop within your daycare. You can clean and fix toys just like an elf. When you are done, you can even wrap the toys with colourful paper. Working in the elves' workshop is a lot of work, but if you really put your heart into it (and listen to Christmas carols while you work), it's also plenty of fun! Are you ready? The elves start their day really early! Memo to the early childhood educator: Set up different workshop areas within your daycare so that children can reproduce the elves' workshop. The sink (or a container filled with soapy water) can be used for cleaning toys and your workbench and tools can be used to pretend they are repairing toys. 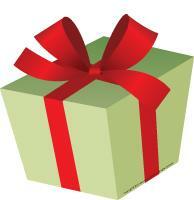 Wrapping paper and ribbon in your arts & crafts area can be used by your little elves to wrap gifts. Today, you will get to meet Santa's reindeer. I am sure you already know Rudolph the red-nosed reindeer. He plays a very important role at the North Pole. He guides Santa's sleigh on Christmas Eve. Did you know that he's not the only reindeer who lives at the North Pole? In fact, there are eight other reindeer which help Rudolph pull Santa's sleigh: Dasher, Dancer, Prancer, Vixen, Comet, Cupid, Donner, and Blitzen. Today, your early childhood educator will show you pictures of Santa's reindeer. You may color them and cut them out to create puppets. You can even create your own little puppet show with the reindeer. Have fun! Memo for the early childhood educator: (Open models-Reindeer) Print the reindeer models and have children color and decorate them. Help them glue the reindeer on Popsicle sticks to create puppets. Use a large cardboard box and transform it to make it look like a stable with help from your group. Using makeup, paint each child's nose red. Today is the last day of our tour. The train will be picking you up in a little while to take you back to your daycare. In the meantime, Mrs. Claus is waiting for you, dressed in her pyjamas. She is in the kitchen and I think she is preparing a very special breakfast in your honour. 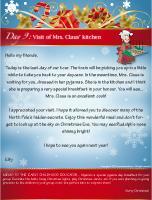 You will see... Mrs. Claus is an excellent cook! I appreciated your visit. I hope it allowed you to discover many of the North Pole's hidden secrets. Enjoy this wonderful meal and don't forget to look up at the sky on Christmas Eve. You may see Rudolph's nose shining bright! I hope to see you again next year! Memo to the early childhood educator: Organize a special pyjama day breakfast for your group. Decorate the table, hang Christmas lights, play Christmas carols, etc. If you were planning on giving presents to the children in your group, now's the perfect time to surprise them! Merry Christmas! (Open perpetual calendar-Pyjama Day) Invite children to wear their favourite pyjama. Of course, you must wear your favourite pyjama too! Let them bring their favourite blanket or teddy bear to the daycare. Each child can introduce his/her teddy bear to the rest of the group. Serve hot chocolate. Serve breakfast at lunchtime. Watch movies and have fun throughout the day!